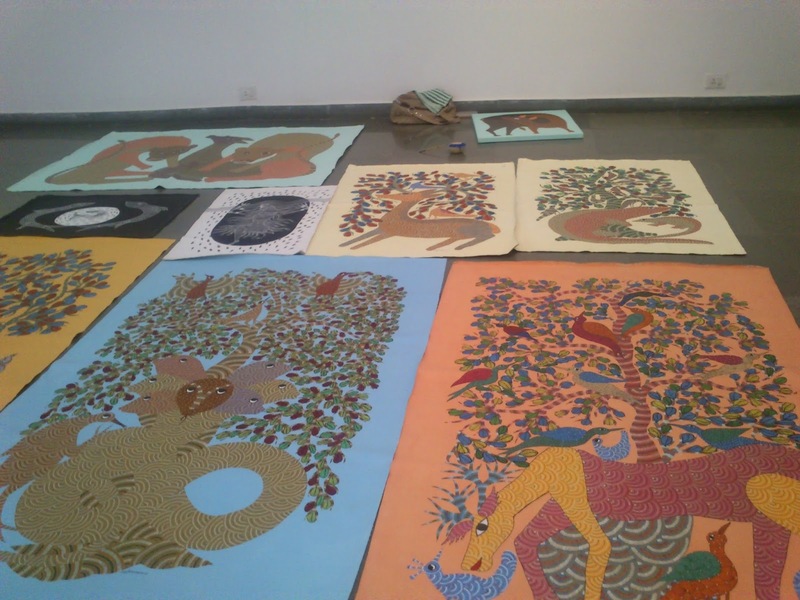 A tribal art demonstration was organized at Gallery Sumukha, Bangalore recently and it was a delight to see Jangarh Singh Shyam’s family members (his wife, Nankusia Shyam) and their associates diligently paint canvases and paper with Gond art. Bright acrylic colours and meticulous detailing filled every inch of the space inside the outlined figures! The Gond tribe is one of the largest Adivasi communities in India and they inhabited the dense forests of the Vindhyas, Satpura and Mandla in the Narmada region in Madhya Pradesh*. As is common with most tribal communities who express their joys and sorrows collectively and in a ritualistic manner, the Gonds too have been celebrating their festivals and rituals with songs and dances. For centuries they have been rooted in their cultural practice and traditions. However, in the 1980s many men from villages began to leave for the cities in search of work. In those circumstances, Jagdeesh Swaminathan, who was the Director of Bharat Bhawan in Bhopal and was constructing the tribal art wing at Bharat Bhawan found Jangarh Singh Shyam who became the first Gond artist to use paper and canvas for his art. As most of us know, Jangarh Singh Shyam’s tribal art found great support and success and was exhibited widely not only in India but also abroad. When in Japan for a three month visit, while he was still in his thirties Jangarh Singh Shyam took his life, under circumstances which are still not clear. When I met Nankusia Shyam, the late Jangarh Singh Shyam’s wife, one could see that she still carried the burden of the pain and loss. Nankusia Shyam revealed that she had no interest in art initially, but later on at the insistence of her husband she began to fill in colours in the figures and drawings. Once Jangarh Singh Shyam passed away, for her, painting was a way to continue his legacy as well as a means of survival. 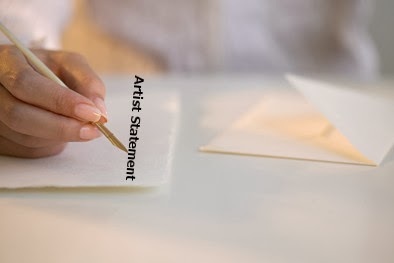 During this phase, many artists tried to take advantage of the situation and promote themselves as Jangarh Singh Shyam’s heirs in the art world. That forced Nankusia Shyam to come out of her mourning and establish herself and her family as the legitimate practitioners of Gond art – or rather the form which was initiated by Jangarh Singh Shyam. She gained confidence as she worked more and often found herself working late in the night to complete images for paintings which had to be delivered. Incidentally, when Jangarh Singh Shyam was alive he already had a system in place where members of his community were apprenticing with him while painting and assisting him. 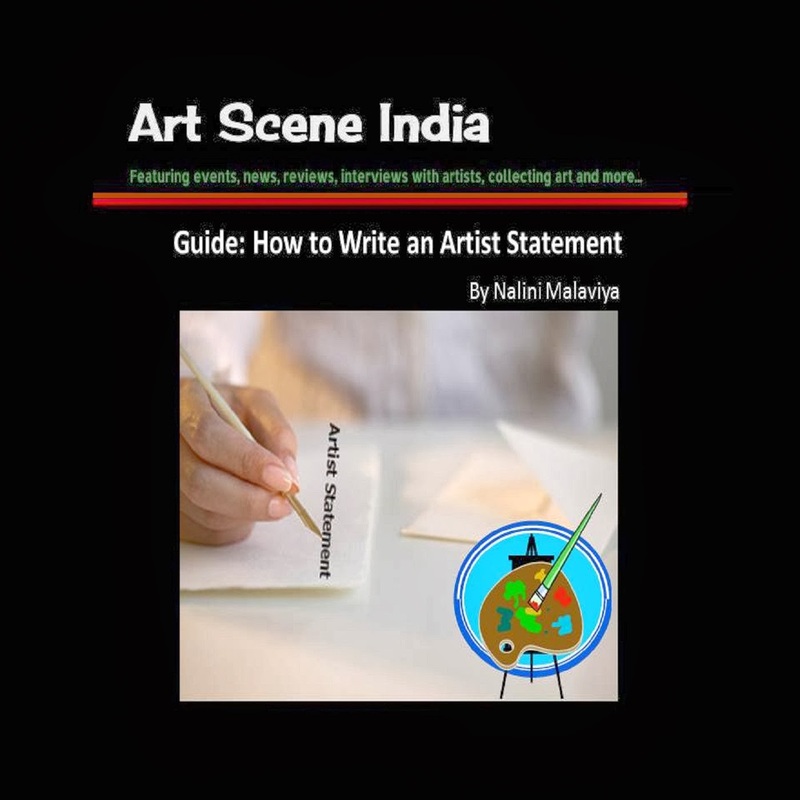 As a result, there is a whole community of Gond artists who are practicing this tribal art form and are exhibiting in art galleries in India and sometimes even abroad. 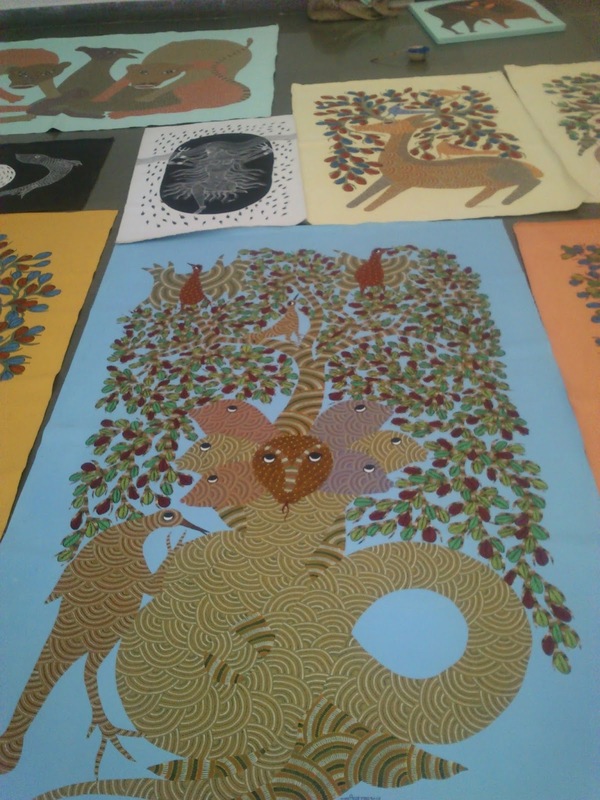 The particular style and genre of Gond painting which was initiated by Jangarh Singh Shyam is termed Jangarh Kalam. Bhuri Bai and Lado Bai who were also present at the demonstration in Bangalore have been associated with Nankusia Shyam for a long time. Coming back to Nankusia Shyam, she has clearly come a long way. If you compare her early works to the recent ones, there is a greater clarity and confidence in the paintings now. Images are refined and there is finesse in her works. 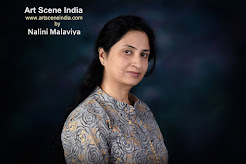 Mythical animals, fables and other stories along with elements from nature are reflected in her paintings. Her two older children, son Mayank and daughter Japani are also accomplished artists as they have been painting for many years. I came across one of Japani’s paintings which was a delightful black and white work, with a fascinating imagery and contextually much more contemporary in nature. 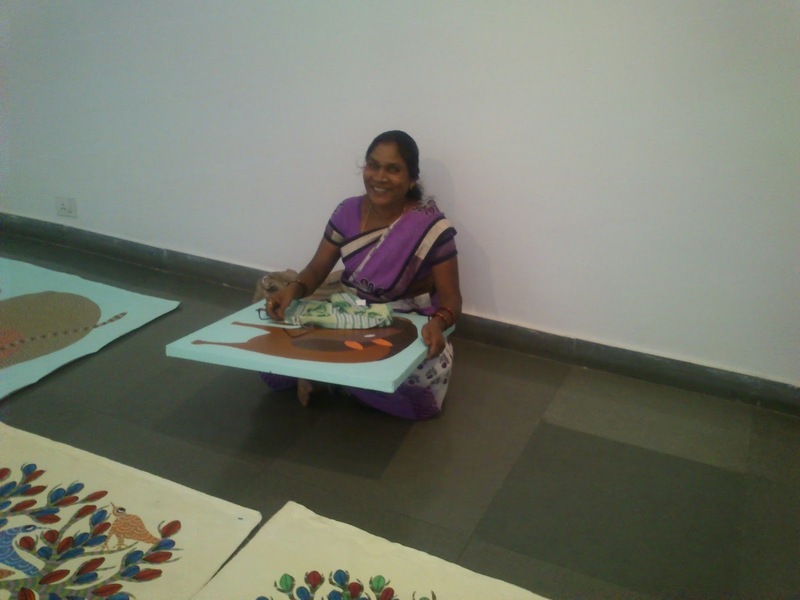 Nankusia Shyam’s youngest son has not shown much interest in painting until now, but she is optimistic that he may take it up soon! Folk and Tribal Art – Survival? Gond art in its current form has been able to establish itself in the mainstream galleries and has also been part of curated exhibitions. 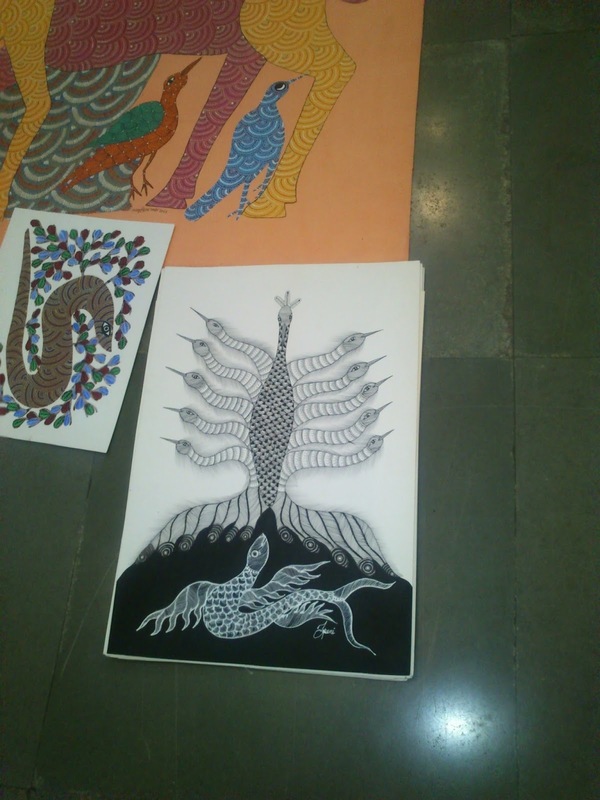 And, although there is a lot of competition amongst the Gond artists to find recognition and acceptance in galleries and auctions, I feel it has fared much better than other folk and tribal arts, which are rendered as crafts displayed in handicraft and lifestyle stores. 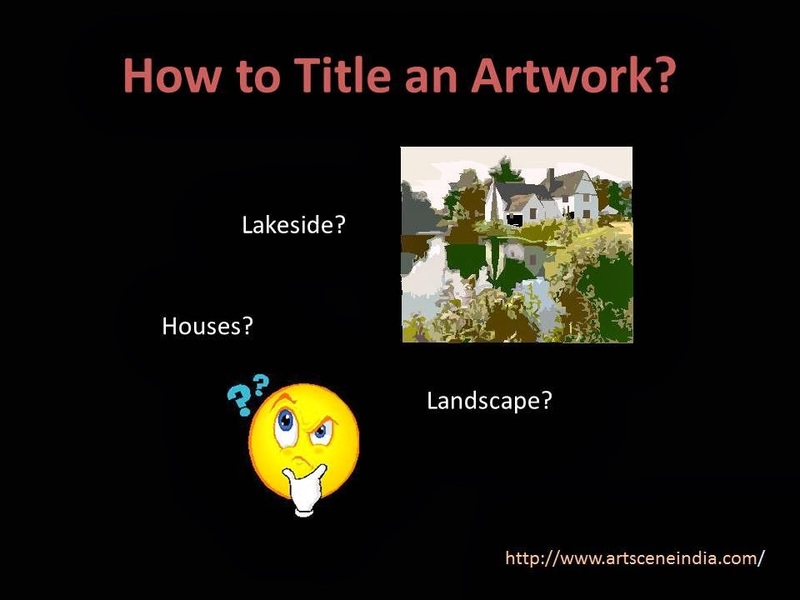 No doubt, commercial and business aspects have crept into the Gond art practice as well, but then one must accept that at the end of the day it is a question of survival. As I have said many times before, what is much needed at this juncture is sufficient government and corporate support to ensure that our folk and tribal art and other cultural practices/traditions can be sustained and conserved.